Are you desperate to find the best dog repellent spray for furniture on the market? While you love Fido, you sure don’t love his hair or drool all over your sofa. You especially don’t appreciate chew marks either when he finds himself feeling a little frisky. Well sit back and relax on your nice, clean sofa while we give you the rundown on the best dog repellent spray for furniture. How To Narrow Your Options And Specific Needs For Dog Repellent? Dogs chew for all sorts of reasons as you can see in this article by the Humane Society. When selecting a repellent, you want to be sure that the device fits your application and situation. You wouldn’t use a bitter-tasting spray if your intention was to keep your dog from climbing on the couch. You also wouldn’t want to purchase something that requires your presence to work if you’re out of the house when the problem occurs. Think about your specific situation and assess what your needs are when it comes to a repellent. Will A Dog Repellent Spray Damage My Furniture? No, most repellents are safe for use around furniture. You want to check the label to be sure the repellent is intended for indoor use with furniture. With fabric, always test a small, hidden spot ahead of widespread use to check for discoloration or staining. If you have indoor plants in the area, make sure you either check the bottle for plant-safety information or steer clear of the plant while applying. Not all formulas are safe for use with plants. Do Spray Repellents Harm Dogs? No, quality repellents are crafted with your dog’s safety in mind and do not cause them harm. Bitter sprays taste unpleasant but do not cause your dog pain or discomfort. Since your dog is ingesting the substance, you want to make sure you thoroughly inspect the ingredients. The closer you can get to an all-natural ingredient list the better. You also want to avoid fragrances and dyes, as they can cause irritation in allergy-prone dogs and may end up staining furniture as well. When Do You Need To Use Dog Repellent Spray? Dog repellent sprays are necessary when dogs become destructive in the home with chewing. Some may chew because they’re teething while others may chew items due to boredom. According to the ASPCA, the use of a dog repellent spray is a safe method of training for nuisance chewers. What Are The Benefits of Best Dog Repellent Spray for Furniture? A dog repellent spray offers the following benefits to a dog owner. Potentially saves owners hundreds of dollars in costly repairs or replacements. Some repellents deter dogs from lounging on furniture and leaving drool/hair behind. Distinguishes what items are for chewing and what items are not. Some deterrent sprays can be used on dogs who lick at their skin excessively. Repellent sprays distinguish healthy boundaries for your dog. What To Look For In The Best Dog Repellent Spray For Furniture ? Here’s what to look for while shopping for the best dog repellent spray for furniture. Make sure the ingredients are harmless to your pet. You don’t want something that will cause pain or discomfort. Study ingredients and be sure the item is intended for use with dogs and cats too if you own them. For sprays, aim for at least a 6-ounce bottle to test effectiveness as reapplication may be necessary. Repellents are affordable compared to repairing damaged furniture. What Is The Best Way To Use A Dog Repellent Spray For Furniture? The best way to use a dog repellent spray is to apply a fine coating to the item. As you can see above, you want to apply a decent application that will last once dried on some items such as fabric chairs. Once a mischievous pup takes a lick or bite, they will be repulsed by the taste and leave the item alone. Be sure to reapply as needed, as the coating doesn’t last indefinitely. The PetSafe SSSCAT Spray Pet Deterrent offers continued reinforcement of desired boundaries with its motion-activated spray mechanism. The sensor picks up on your dog’s movement in the forbidden area and releases a spritz of spray. While harmless, the unscented spray is unpleasant to pets and causes them to leave the area. It’s a powerful tool with a lot of perks. This spray can be used indoors or outdoors, and is safe for furniture, plants, leashes, clothing, shoes, socks, purses, electrical cords, blinds, woodwork, curtains, and so, so much more. If the PetSafe SSSCAT Spray doesn’t work out for you, don’t stress. It comes with a money-back guarantee. If you aren’t satisfied for any reason you’ll receive a full refund. I like that I can move the device throughout the house as needed and modify it to fit each use. I can go from protecting the couch from dog hair during the day to defending the trashcan full of chicken bones at night with a quick adjustment of range. Best of all, this is ideal for multi-pet households like mine. Many deterrent sprays are not cat-friendly so finding a formula that fits them all is a major bonus in my book. 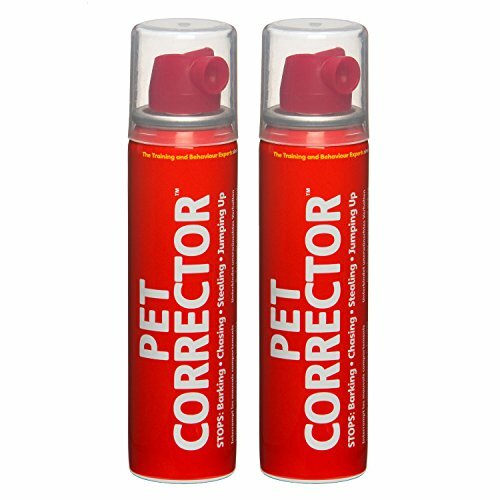 Pet Corrector is a great tool for correcting your dog as needed. It works by releasing a harmless burst of air which creates a distinct hissing sound that dogs dislike, temporarily distracting them and redirecting their focus towards you. Rather than raising your voice or fighting for your dog’s attention when you’re telling them to get off the couch, you simply press the button and let the Pet Corrector do its thing. My dogs were very responsive to the sound, consistently turning their attention to me. It allowed me to direct their focus on me and the correction I was implementing. After a few uses, my dogs knew that the sound meant “off” and vacated their spots on the sofa without a fuss. I did feel there were some potential issues that other owners may have also felt when using this product. This bitter spray is one of the oldest and most famous. Grannicks Bitter Apple was first formulated in 1960 when a dog owner asked a pharmacist if he had anything to stop her nervous dog from chewing his fur. Today, it comes in an 8-ounce bottle and is the bestselling dog repellent spray on Amazon. It comes with hoards of positive reviews and anecdotes of success. Grannicks Bitter Apple is non-toxic and is trusted by veterinarians and groomers. It can be applied on furniture, fabric, or right on your dog if they have a habit of chewing their paws or fur. As an added plus, this bitter spray leaves hardly any odor—so it won’t offend your nose or the noses of your guests. Despite its effectiveness, Grannicks Bitter Apple comes with a small warning: may stain surfaces. For the sake of your furniture, make sure to do a quick color test somewhere discreet. Bitter Apple is a solid choice for homes with destructive chewers like my Moxie, as this stuff is seriously vile. Its formula relies on bitters to get the job done and boy does it ever. My Moxie took one lick and backed away in disgust, forgetting all about her targeted chair leg and redirecting appropriately to her bone. 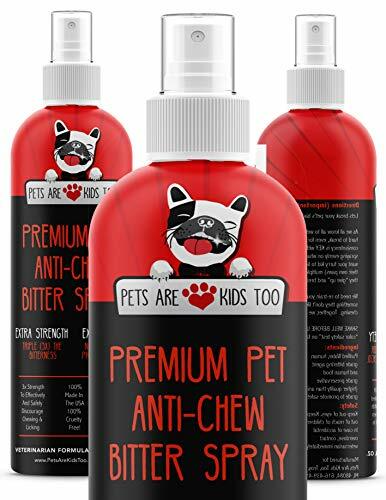 The red and black on this bitter spray serves as a warning of just how bitter it really is: the Premium Pet Anti-Chew Bitter Spray is a triple strength bitter spray for maximum effectiveness. It is so bitter that the bottle warns to wash your hands immediately after use and not to breathe in the scent. Despite this, the spray is safe for your dog and is made with human-grade bitter agents. It contains no propylene glycol and no alcohol. If you turn the bottle of your Premium Pet Anti-Chew Bitter Spray around you might be surprised to see a picture of a pet on the back. Every bottle purchased helps save a pet with cancer, and on the back of each bottle, you can see a picture of the exact dog that your purchase helped. If this isn’t the spray for you, don’t worry: this one comes with a satisfaction guarantee. 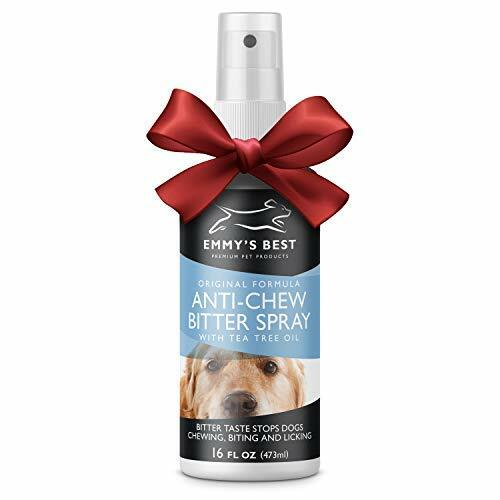 Emmy’s Best Professional Anti-Chew Bitter Spray is alcohol-free and ultra-bitter with a patented formula to stop dogs from chewing, biting, and licking. It comes with a 14-day online training program to help you use it in the most effective way possible while encouraging your dog’s good habits and discouraging destructive tendencies. This training program is a nice bonus to go with a reliable spray. Besides the bonus training program, this bitter spray also comes with a satisfaction guarantee. If you are unsatisfied for any reason you can get your money back up to a full year from when you bought the spray. This spray is safe for furniture, and can also be used on clothes, shoes, plants, floors, blinds, and just about anything else. Emmy’s Best Bitter Spray comes with plenty of positive reviews, as well. With the money-back guarantee and the excellent track record, this bitter spray is an excellent choice. Emmy’s Best Anti-Chew Bitter Spray is great for protecting your furniture from teething puppies and mischievous adults as well. Another bitter spray, this behavior aid is meant for direct application to the items you don’t want your pet to chew. Like some other sprays, it can also double for pet first-aid usage. While it does its duties in some respects, I didn’t find it as effective as other formulas. While my dogs turned their noses to it, one did try for a second lick which wasn’t promising. Can I Use a Repellent Around Cats? It depends. Some repellents explicitly state that they are safe for use around cats. In multi-species households, you want to read the label thoroughly and check for a designation about cat safety. Cats are susceptible to certain chemicals used in dog products so do your due diligence before using any dog product in the home around them. Can I Use a Repellent With a Puppy? Yes, using a repellent in puppy hood is helpful in preventing nuisance chewing in the long term. You want to establish clear boundaries for your puppy early on and using a deterrent such as a spray is highly recommended in doing this. Puppies need to learn what items are appropriate to chew and what items are forbidden. Puppy owners can also use some spray repellents on their hands to curb mouthing and nipping, two common problems seen in young, teething puppies. Be sure you read the label to ensure safety and wash your hands thoroughly after use. Do Repellent Sprays Prevent My Dog From Chewing Furniture? 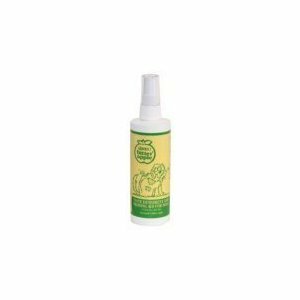 The best dog repellent spray for furniture work by providing round the clock protection either through a bitter coating or a motion-activated sprayer. Both options keep your furniture tooth-free while you go about your life outside the home. You want to test your dog’s reaction first before trusting them alone, as some dogs may need a stronger spray application to prevent chewing. With sprays, be sure to reapply as needed for continual coverage and peace of mind. Are Repellents Only For Keeping My Dog Off of Furniture? No, some spray repellents can also be used to help dogs that suffer from hot spots or other painful skin conditions. The spray helps by preventing harmful licking or biting at the affected area. Make sure you read the label and only use repellents approved for such use when applying to a dog’s skin. Other items may be used to prevent nuisance behaviors in dogs such as barking or jumping on visitors. The items include air sprayers that release a harmless puff of air that makes an unpleasant sound. The sound causes the dog to cease the unwanted behavior and redirect their attention. Will My Dog Be Sad That I Don’t Want Them on the Furniture? No, according to dog trainer Cesar Milan, your dog needs to have established rules to coexist happily in the household. If you don’t want them on a specific couch or chair, preventing them with a repellent won’t make them sad. They’ll learn over time that the place is off limits and find a more suitable place to hang out, saving you wear and tear on your furniture and money in the long run. Claiming your space as an owner is important in establishing your role at the top of the pack. Deciding on the best dog repellent spray for furniture wasn’t all the difficult, given the fact that some products simply didn’t hold up to the sniff test. While on required owners to physically be present in order to be effective, others have mixed results when it came to application. Sprays did not offer long-term results across the board. The clear winner is the Petsafe SSSCAT Spray Pet Deterrent because of its continued repellent properties. Owners don’t have to fuss with reapplying coats of spray or worry about being in the room to get their dog to respond. The device allows dog owners and their beloved pooches to live in harmony without chewed couch ends or slobbery sofas.